The Grove connectors in the Switched row (a) share a common switched power line. This is controlled through the digital pin GROVE_PWR (D22). These sockets are ideal for sensors which need to be powered down between readings. The LED (c) is lit when this row is powered on. The Grove connectors in the Always On row (b) are always powered on. These sockets are for sensors that need to be powered permanently or for sensors which have a low power draw. 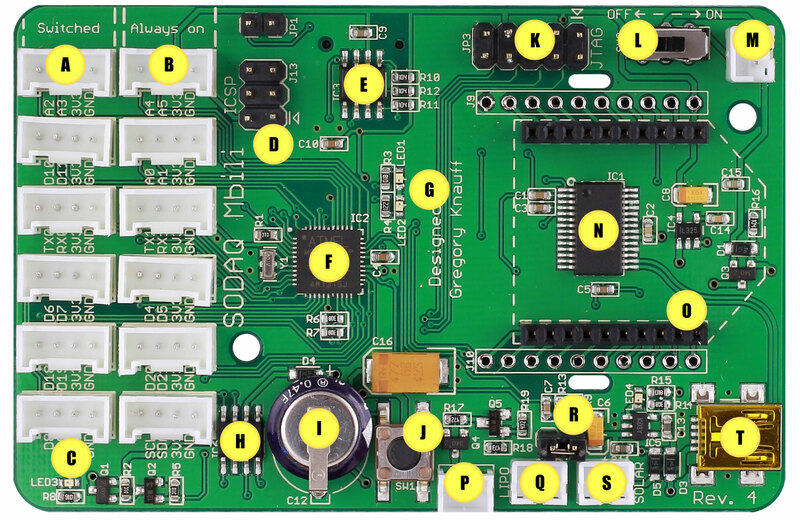 The standard 6 pin ICSP header (d) can be used to program the SODAQ Mbili, including loading or reloading the bootloader onto the board. 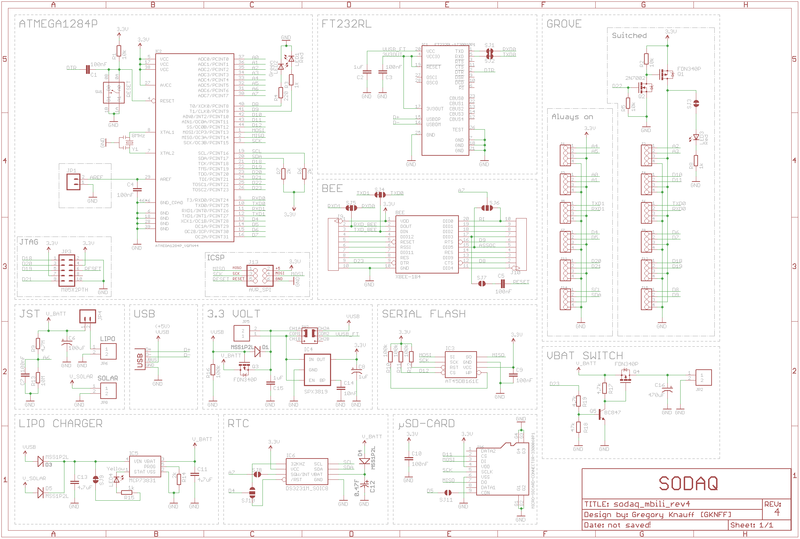 Just like the SODAQ Moja the SODAQ Mbili has 16 Mbit serial flash (e). 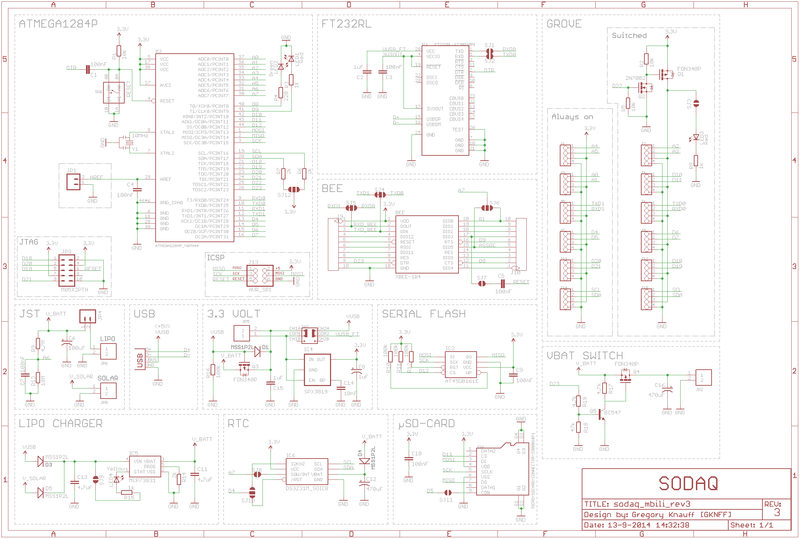 The SODAQ Mbili has a ATMega 1284P microcontroller (f) and two user programmable LEDs (g). The DS3231 real time clock chip (h) is now powered by a super capacitor (i). This allows the real time clock to continue ticking for several days after the battery has been removed. The reset switch is located at (j). 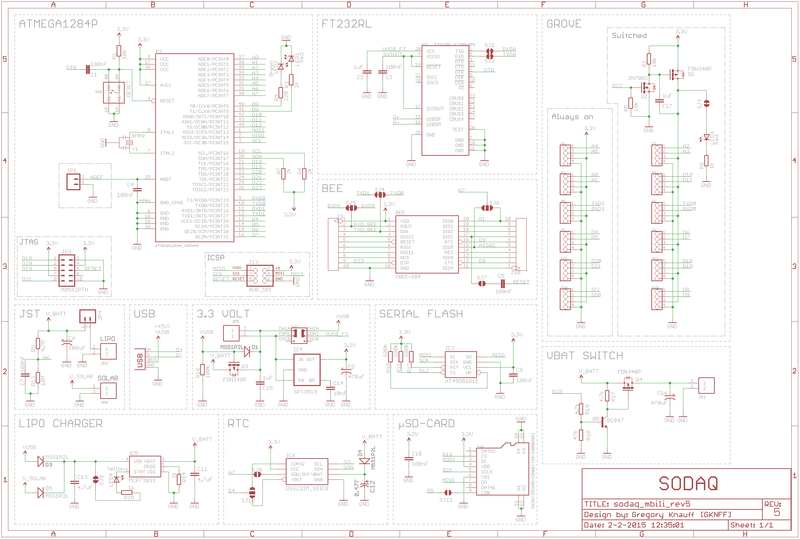 The SODAQ Mbili now has a JTAG header (k). This can be used for debugging purposes. The On/off switch is located at (l) and a header for an external switch at (m). For the USB connection a FTDI chip (n) has been used again. This is powered off completely when no USB cable is connected. The Bee socket (o) is now connected to a separate UART. This means that the communication module in the Bee socket can be used while also sending debug output over the USB port. Specifically for the GPRSBee module, a separate power connector (p) has been added. This allows for software control over powering the GPRSBee module on and off. The battery connector (q) and the solar panel connector (s) are the same as on the SODAQ Moja, A jumper (r) has now been added which can be used to measure the power draw from the battery. This jumper needs to be closed when it is not being used for measuring. The USB connector is located at (t). (1) The most significant change on the back side of the board is that of the inclusion of a MicroSD card slot. The extra memory and program space of the ATMega 1284P, can easily accommodate a FAT file system and the use of the a MicroSD card for data logging. (2) Can be used to connect the Bee socket to Serial instead of the default Serial1. (3) Can be used to enable the card detect functionality of the MicroSD card slot. (4) Can be used to allow for ‘over the air programming’ through a Bee module. This requires that the Bee socket is connected to Serial using Jumper (2). (5) Can be used to disconnect the Charge indicator LED to minimise power consumption. (6) Can be used to disconnect the Switched Grove LED to minimise power consumption. 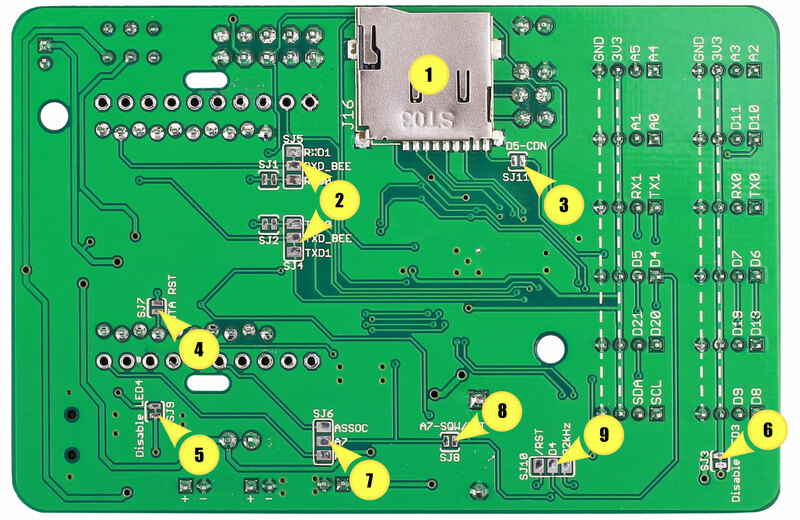 (7) Allows the connection of either the ASSOC pin of a Bee module or the Ring Indicator line of the GPRSBee to an I/O pin. (8) Allows the RTC to be used as an interrupt device. (9) Allows the RTC to be used as a 32kHz clock source.